Families across the nation are already feeling the effects of the government shutdown, from the cessation of processing passports to closed national parks. NBC's Peter Alexander reports. Orange Room host Carson Daly asks visitors to the TODAY plaza and Twitter users viewing at home to share their #DearCongress messages with TODAY. 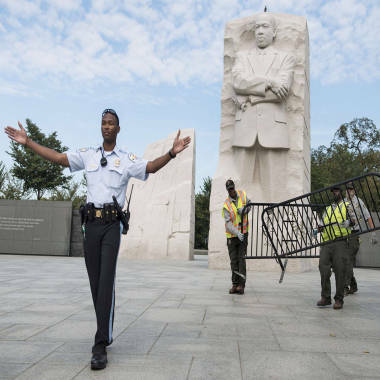 A U.S. Park Police Officer waves people away from the Martin Luther King Jr. Memorial on the National Mall in Washington.